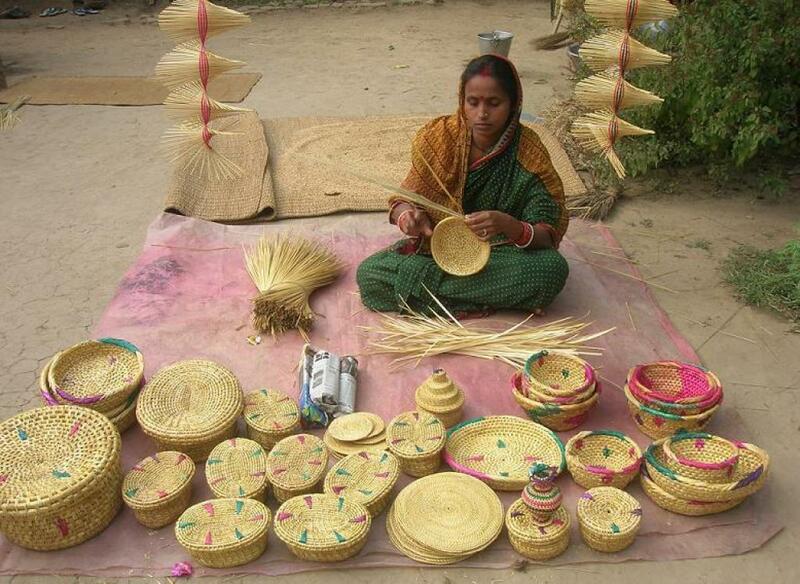 Thanks to the huge demand for items made of golden grass, the bustling colonies of craftspeople in many riverside villages of Odisha’s Kendrapara and Jagatsinghpur districts today reflect the wealth they have acquired. This age-old craft is a blessing for the poor people of these areas as it requires very little capital and provides a steady source of income. Around 2,000 women belonging to 200 Self Help Groups (SHGs) make various items from golden grass. “We train artisans to create various decorative items like hats, fans, bowls, baskets, toys, pen stands, flowers pots, wall hangings and mats from the golden grass. Now, each of them earns between Rs 3,000 and Rs 10,000 in a month by making items from the golden grass. Today, the craft of golden grass exists as a cottage industry here", said Swaranalata Jena, an artisan of village Jajanga in Kendrapara district and the secretary of Ma Mangala SHG. "I joined an SHG in our village to learn golden grass crafts and within six months, I managed to make several items from golden grass. Now, I earn Rs 4,000 from it", said Sasmita Das of Baro village. A new concept of golden grass jewellery has come from here, where we make attractive and designer jewellery and other accessory items like bags, key chains and other items from the golden grass, said another artisan Sagarika Das from Baro. “Golden grass (Vetiver zizanoids), known locally as ‘Kaincha’, is a wild grass found in many riverside villages of Jagatasinghpur and Kendrapada districts of Odisha. It grows to a height of about 5-6 feet and the inflorescent stick, which appears after the monsoon, is used for weaving. Collecting raw material remains the responsibility of women, who usually set out in groups, often having to wade through water to collect sufficient golden grass. Once collected, the grass is split into two even strands. The women use their teeth to split each stem along its length. “As the grass dries, it changes colour from pale green to mild yellow to golden yellow. This is where the craft derives its name. The origin of this craft, as it is in the case of other arts and crafts, is centuries old. Since generations, golden grass items like bowls, fans and mats have been used as utility items in many parts of the state. Women, during their leisure time, prepare these high-quality craft items at a common place. This traditional craft has been handed down from generation to generation,” said Sarojini Behera, a craftswoman from Baro. Now-a-days, golden grass is making waves and more and more city dwellers are discovering the beauty of its products as they are eco-friendly, biodegradable and reduce the use of plastic. It was this craft that helped many to come to terms with their life and to create a self- determined future for themselves through SHGs. Most families make golden grass items collaboratively, with all members contributing. Even children help with the colouring of the items. Latika Jena, a housewife from Baro, got training from the officials of the district industry centre (DIC) in Kendrapara two years back and she first weaved pen stands, hats and other new items. “Her enterprise has helped many from our village to add to their income and change their lives for the better", said Gita Jena, also from Baro. Tapasi Jena, a landless woman from Kapaleswar village said, "I have been earning my living by weaving golden grass items mats for the last three years. I have already married off my only daughter with the earnings from this," said Tapsi. “Today, the demand for golden grass crafts has increased and this testifies to their beauty, utility and lasting quality”, said Santosh Kumar Mishra, general manager of DIC, Kendrapara. The DIC and NABARD provide skill upgradation training to craftspeople to make golden grass items to meet the huge demand from urban residents. “We also provide artisans with platforms to sell their items in many exhibitions and festivals in and outside the state”, added the officer.